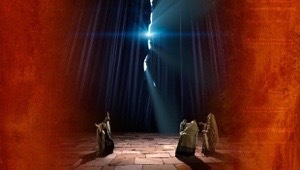 ” And Jesus cried out again with a loud voice, and yielded up His spirit. Yesterday’s post based on 2 Corinthians 3:18 started me thinking about how St. Paul described us as having “unveiled faces” and thereby reflecting the light of Christ’s love to others. The veil or curtain was hung before the Holiest of Holies in the ancient Hebrew temple. Ever since Moses came down from the mountain meeting God and receiving the Ten Commandments people were afraid to get too close to God. As sinners, humans live in fear of being “burned” by standing too close to a Holy, Almighty God. That changes with Jesus. He takes some of His friends with Him to the Mount of Transfiguration. Peter is scared! Dear Peter, when he gets frightened he babbles. He invariably says something foolish. How often when uncertain have I done the same? Peter, the unsteady is transformed by the resurrection into Peter the Rock. He stands in the presence of a Holy, Almighty God- JESUS and witnesses His glory. Peter’s human frailty shows through, but no bad thing results in this. On the contrary, Peter is being transformed. That is what I try to remember when I feel tested beyond my strength. When my best laid plans land in tatters because of trips to the emergency room and doctors with my Dad. The schedule didn’t work, but my Dad is OK. And the fatigue and migraine, scramble to get groceries and doubts about what I’m going to make for dinner these are petty worries. I can’t veil my face and fret about how out of control my life is. My life is out of my control. But it is not out of God’s control. I probably will say and write words that make me look foolish. I don’t have it all together. In spite of this I know that Jesus love is enough. My activities may not be completed according to my plan, but I am complete in Him. Let Your love shine thought me Lord Jesus! Amen.